Machu Picchu Guest House i Aguas Calientes, Peru: Reservér nu! Machu Picchu Guest House, is strategically located in the town of Machu Picchu Aguas, a place surrounded by beautiful mountains with impressive vegetation and access point closest to the Historic Sanctuary of Machu Picchu. Located a block away from the Train Station, commercial sites, the famous artisan fair, thermal baths and bus station from where the citadel of Machu Picchu is part of. Wiñaywayna Park is a 1-minute walk from the accommodation, while Craft Market is 200 metres away. We have spacious rooms, orthopaedic mattresses, free Wi-Fi, hot water 24 hours, free storage service, included breakfast from 4:30am to 9:00am. The rooms include a patio. 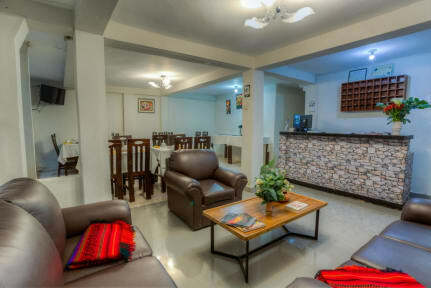 All rooms at Machu Picchu Guest House come with a seating area. We speak English, Spanish and Portuguese, staff are ready to help around the clock at the reception. Cancellation policy: 72hs before arrival. Foreign customers exempt from tax.